The Australian Blood Lime is one in a range of hybrid limes developed by CSIRO Plant Industry for commercial cultivation. 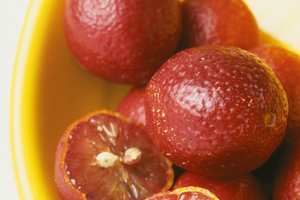 The Australian Blood lime is a hybrid produced by open pollination, from a cross between an Ellendale Mandarin (a mandarin and orange hybrid) and a seedling form of the Australian Finger lime (Citrus australasica var. sanguinea).